Leading off the program, I started my course with an introduction to overarching concepts (e.g., the changing legal landscape; people, process, and data before technology). Next, I provided an overview of artificial intelligence, including rules- versus data-driven systems. (Assigned reading included Computational Law: The Cop in the Backseat, by Michael Genesereth, Codex – The Stanford Center for Legal Informatics.) From there, we jumped into an exercise that required each student to build an interactive question and answer system in QnA Markup that would guide a user to a determination of whether the General Data Protection Regulation (GDPR) applies to the user. To get the students started, I provided them with a couple of flowcharts of this GDPR analysis published by international law firms. I’ve had great success using QnA Markup in my Institute for the Future of Law Practice, University of Michigan Law School, and Michigan State LegalRnD courses. (I’ll share more about 2017-18 LegalRnD projects in another post.) David Colarusso, Director of the Legal Innovation and Technology Lab at Suffolk University Law School, developed QnA and makes it freely available. QnA is easy to learn, but powerful enough to prototype solutions to challenging problems. I use it to introduce computational thinking, conditional logic, basic programming principles, document automation, and expert systems. Building a QnA expert system requires a firm grasp of the current process for delivering services and deep knowledge of the applicable substantive law. Therefore, this hands-on, team-based approach is not only an excellent way to learn about legal technology and contributing to an interdisciplinary team, it is also a great way to really learn the intricacies of the underlying substantive law. Employers want to prevent departing employees from disclosing valuable know how or other sensitive commercial information to potential competitors. For that they include non-compete clauses in employment contracts. The law and court decisions have set parameters that define when those non-compete clauses are valid or not. We propose a system that helps departing employees understand whether not complying with the clause puts them at risk of a lawsuit. 4 Family law Paths to divorce: a decision tree on whether a couple qualifies for divorce by public notary, marriage office or court depending on the spouses’ context. 7 Convention on the International Sale of Goods (CISG) In international contracts on the sale of goods, the CISG is oftentimes to be applied (lots of rules in the convention) if parties do not explicitly exclude it (e.g. “This contract is governed by the law of Germany under exclusion of the CISG” (if they leave out the last part of this sentence, the CISG will be applied in court even though it just says “law of Germany”)). This will often lead to a situation in which lawyers don’t know which law is applicable to the contract. This presents problems because hardly anyone is well-versed in the provisions of the CISG. The idea would be to create a tool that helps with determining whether the CISG is applicable in this case. 11 Financial Regulation / ICO Is my token a financial instrument under EU-Law? 12 Consumer Rights As a consumer, can I return the good I bought? 13 GDPR – Data Privacy Creating GDPR compliant privacy notices. 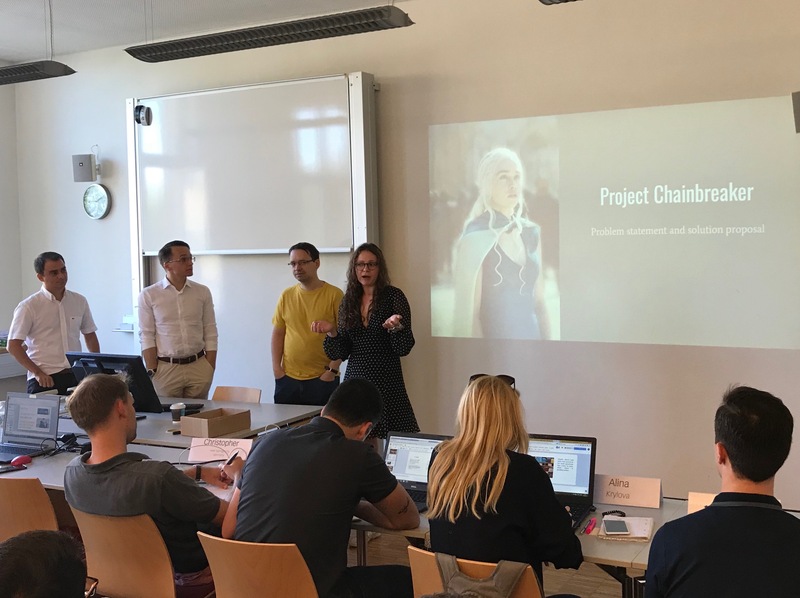 During the balance of this first class, the teams began work on their one-week sprint to build a working prototype of a QnA expert system with document automation, which they would present as a team to the class the following Monday. Ideally the students would have had more training in project management and process improvement at this point. For a jump start, I introduced lean startup principles and the Improvement Kata and had them read the “Amazon press release” “working backwards” approach to product development. I asked the students to use the Amazon approach as a framework to focus their work and as a guide for their initial team presentation of their use case during our next class meeting. As busy as we kept the students with my class, other classes, evening lectures, and activities, requiring a team project presented a challenge. And the students squarely met that challenge, delivering excellent prototypes and presentations during our final class meeting. It was exhilarating to be a part of the Bucerius program. These students and many others around the world have embraced legal innovation and technology and are actively working to improve legal-services delivery, justice systems, and society. I cannot wait to see the big things that they do in the future!